The Brooklyn Community Foundation is looking to press the reset button. The $60 million foundation, which focuses its grant-making in Brooklyn, was intended to grow in influence and size when it transitioned from the private Independence Community Foundation into a full-fledged charity in 2009. The feeling was that as the borough grew in both affluence and cultural cachet, neighborhood-based philanthropy would rise, too. But that never really happened for the Brooklyn Community Foundation. Assets remained steady. Grant-making plugged along. The foundation did its job, but never really soared. With superstorm Sandy serving as a kind of catalyst for the borough—and for local philanthropy—the foundation is taking a new tack under the leadership of Cecilia Clarke, who began as president last September. Fast-talking, forthright and lively, Ms. Clarke, 51 years old, sums up her vision for the foundation simply and with a chuckle: "We have $60 million; we should have $160 million. We're the fourth largest city [in the U.S.] with 2.6 million people. We've got a lot of ground to cover." To grow the foundation in scope and assets, Ms. Clarke and her board are fully embracing fundraising, which in the world of community foundations means gathering assets to hold and distribute. Ms. Clarke wants to encourage donors to use the foundation as a pass-through funder, with her acting as matchmaker between donor and nonprofit. A big part of her plan to increase assets involves boosting the foundation's number of donor-advised funds, a giving mechanism that allows a person to reap an immediate tax benefit and then make donations. Those funds are the bread and butter of most community foundations, but Ms. Clarke says the Brooklyn Community Foundation has never excelled in attracting that kind of money. Ms. Clarke also wants to focus the foundation's giving by distributing larger, more meaningful grants that can move the needle on specific problems within a community. Traditionally, the foundation has sprinkled its resources around through small grants—usually between $10,000 and $15,000. Recipients ranged across a wide swath of funding areas, including arts programming, community development and environmental projects, among others. Grants supported everything from the Brooklyn Children's Museum to a literacy project for Haitians and a program operated by Green Guerillas that supported 90 gardens in Central Brooklyn. The strategic change came, in part, after a listening tour last year, said Ms. Clarke. That is when many community members asked her to "please figure out what you stand for," she said. To that end, the foundation is pausing its grant-making to meet with local leaders and neighborhood advocates to get a better handle on the needs of each community, which in turn will define funding priorities. These "roundtable" meetings will continue through the early summer. 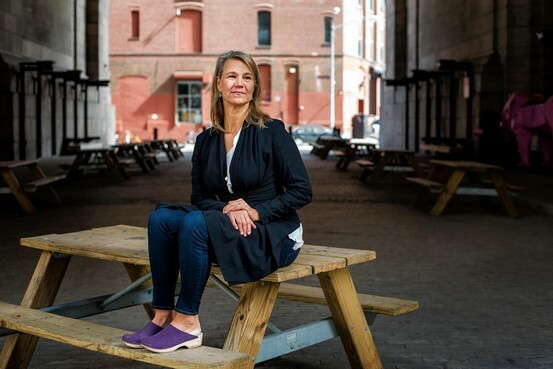 The vision of a community foundation for Brooklyn is still evolving, said Mindy Duitz, the president and chief executive of the Brooklyn Children's Museum. Ms. Duitz has worked for and raised money for nonprofits for 35 years, her museum has consistently received grants from the Brooklyn Community Foundation and she has participated in roundtable discussions hosted by the foundation. Within Brooklyn, there is an established, older generation of philanthropists, she said, but the new wave hasn't yet fully coalesced. "Brooklyn is changing, Brooklyn is hot, it's got a global brand right now. But it doesn't mean everyone in Brooklyn yet knows how to be a philanthropist and understands the needs," said Ms. Duitz. For the people who have moved to the borough to raise a family or to start a business, Ms. Duitz said, she believes it will be a decade before would-be philanthropists "even have the ability or understand what they want to give to in Brooklyn. I think it's just easier said than done." To be sure, the Brooklyn Community Foundation plays little sister to the Manhattan-based New York Community Trust, one of the largest community foundations in the country with $2.4 billion in assets. In 2013, the New York Community Trust made $141 million in grants, with $4 million directed to organizations based in Brooklyn. 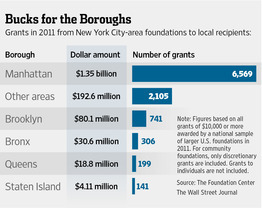 By contrast, the Brooklyn Community Foundation made grants totaling $3.4 million directed to Sandy recovery efforts. In all, there are around 20 community foundations throughout New York with assets totaling $2.9 billion, according to the Foundation Center, which tracks foundations. Ms. Clarke has made her career in nonprofits and came to the top job at the Brooklyn Community Foundation both as a 25-year Brooklyn resident and as a grant recipient. In 2001, she founded the Sadie Nash Leadership Project, a New York-based program that provides leadership training to young women. The Brooklyn Community Foundation was an early funder of Sadie Nash. When Ms. Clarke was approached to take over the foundation, she says it was the only job to get her to leave Sadie Nash. She was attracted to the entrepreneurial opportunity and the larger playing field. Later this year, the foundation will leave its offices in Dumbo for new digs in Crown Heights, one more signal to Ms. Clarke that this established foundation can still be called new. Said Ms. Clarke: "We're allowed to still call ourselves a startup."